Summary: The purpose of this webinar is to introduce crop consultants and other practitoners to the Plant Management Network’s internet-based information resources. These include four peer-reviewed journals, efficacy trials for various pest controls, searchable databases of extension documents, and other important science-based information that helps users with their everyday work. 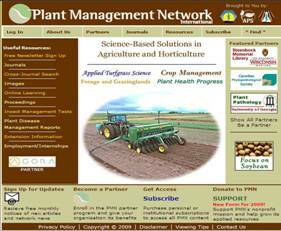 Responsibility: All presentations published on The Plant Management Network reflect individual views of the author/presenter(s) and are not an official position of The Plant Management Network or the author/presenter(s)' affiliated institutions, companies, or organizations. No endorsement of products or companies, institutions, or organizations is intended, nor is criticism implied of those not mentioned. Individuals using agricultural products or any products referenced by The Plant Management Network or its partners, sponsors, or advertisers, should ensure that the intended use complies with current regulations and laws, as well as conforms to the product label.